In today's National Post there is a 'full comment' entitled, "Lie Low, Planet Earth." The idea of an OCP reportedly came to Mr. Banks while he played the computer game Civilization, wherein players control the evolution of a society from a single group of nomads to a global superpower. Mr. Banks had developed a successful and prosperous medieval island society that he thought was doing quite well, until another civilization showed up off his shore with steel-hulled battleships. The arrival of the technologically advanced newcomers, he realized, posed for his simulated citizens a problem so far outside their normal context that they were effectively helpless. Based upon the idea of an OCP, perhaps prudence recommends that we not advertise our existence to alien civilizations? Any society capable both of detecting our presence and of crossing the vast distances of space to reach Earth would be so far beyond us technologically as to leave humanity, to say the least, at a disadvantage. The first alien starship to arrive would be, to us, very much like those strange metal battleships to reach the shores of Mr. Banks’ digital kingdom. I'm pretty risk adverse in general, so the "lie low" strategy seems sensible. Sure, our interstellar neighbours might be like the Vulcans (RIP Leonard Nimoy). But they also might be like the aliens in, er, Alien and Aliens. Wotan and Thunor bless the 29 brave Saxon warriors who fell to the cowardly Parisii. Nine, captured in battle, were cruelly slaughtered by their witch who used their blood, souls and skulls to build a Ghost Fence in a pathetic attempt to protect their miserable hillfort. Thrice one thousand curses on her head! May Gullveig's Children tear her limb from limb. Six were most foully butchered in a forest ambush as they sought to bring some lonely Celtic women and children to safety. 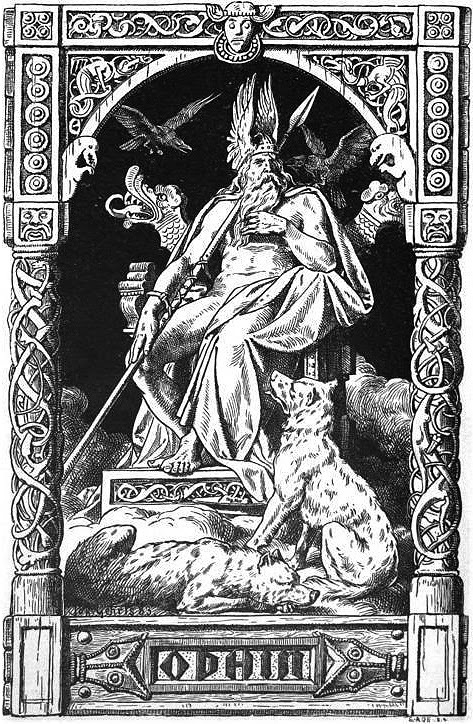 The Parisii dogs who call themselves the Sons of Cernunnos hid like sceadunga in the shadows and would not face these loyal thanes weapon to weapon. And fourteen fell in brave combat, although these good thanes and sons of Wotan engaged their enemy and made them bloody. The magic of the Britons was powerful; one witnessed the Screaming Warrior shrug-off spear thrusts as though clad head to toe in mail. 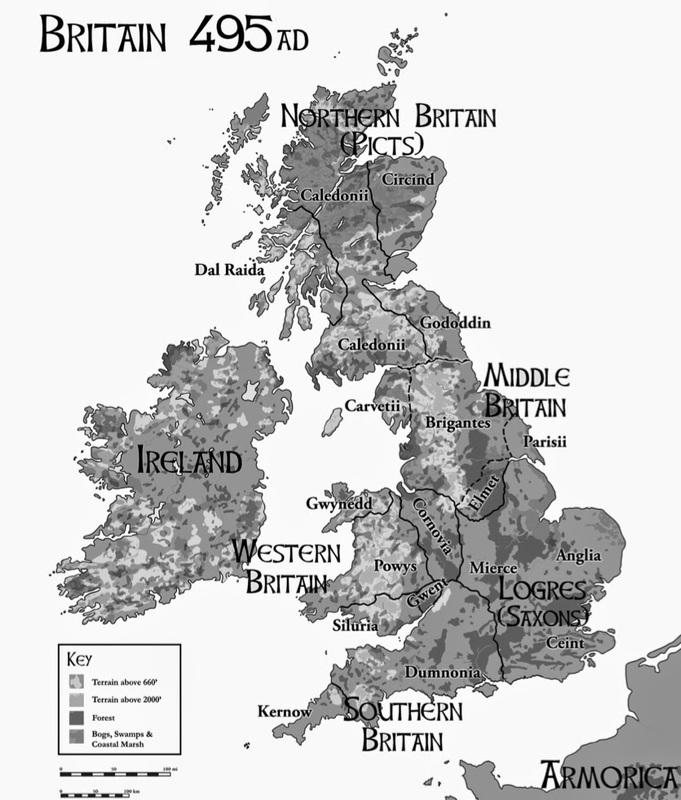 Victory would have been theirs if the craven Britons had fought toe to toe and not broken the Saxon rank with distressed horses and more assassins who lurked in the bracken and hurled spears like pitiful womenfolk. Lord Hengwulf and King Guercha mourn these fine warriors. Comfort is taken in knowing that their souls now feast in Valhalla and tomorrow shall battle and be victorious for all eternity! The Parisii shall pay. Aelflas is coming, and she brings Hel in her wake like a cloak of torment. An epic battle last night. Mass sacrifice on an almost industrial scale as Gwynneth made a Ghost Fence from Saxon prisoners. Then, rushing to protect the women and children hidden in a forest cave, the characters managed to outpace and ambush a Saxon warband, which had fortunately become splintered and disoriented in the wild woods of the Eboracum Vale. In a moment of freakish good fortune, the three characters who are the Sons of Cernnunos (Cunnen, Aild and Gawain) each rolled 05, one after the other, scoring critical successes in the ambush on the first six Saxons. This incredible feat of luck earned them a bonus Luck point and an immediate +5% increase in the Brother of Cernunnos Passion. Later, Cunnen was impaled in the thigh by a well-aimed Saxon spear and unable to take part in the ensuing fight, but his brother in arms Aild invoked the berserker rage and hurled himself at the Saxon shield wall. The wall was broken as Gawain drove panicked horses into it and they tried to change their facing to deal with attacks from front and flank, and this allowed Aild, in another moment of blessed luck to critically avoid being tripped while his attacker fumbled his next spear thrust and impaled his colleague. After that, the battle was over. The Saxon ranks were broken by good tactics and a huge helping of good rolls on the Parisii side, and shockingly bad ones on the Saxons. Of course, my character, the scholarly Roman 'Lucretius', was far away from all this bloody savagery. Apparently the classic Dungeons & Dragons "Known World" setting -- later "Mystara" -- originated as a home-brew campaign world created by Lawrence Schick and Tom Moldvay in 1974-76. Unsurprisingly (to anyone familiar with the D&D module X2), Clark Ashton Smith was a major inspiration. Schick has the details in this post at the Black Gate. The announcement from D101 Games is here. The new cover looks gorgeous. No information yet on what specific changes there will be to the system, though Newt has commented that there will be some "streamlining" of the rules. Although I haven't played Crypts and Things recently -- I've been focused more on d100 games like RuneQuest, Call of Cthulhu, and OpenQuest over the past few years -- Crypts & Things remains my absolute favourite 'quasi-clone' (old school D&D-ish) game. 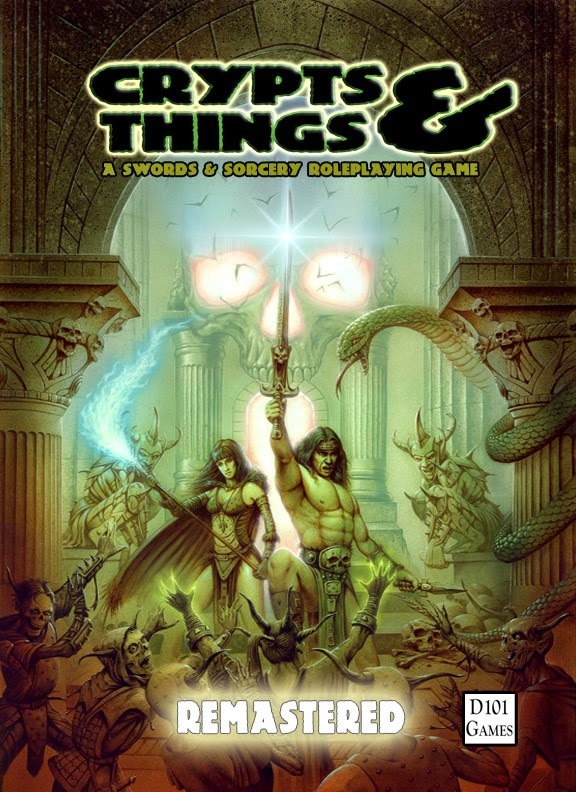 This should not be surprising, given that it's based upon my favourite 'retro-clone' game (Swords & Wizardry) and incorporates some of my 'swords & sorcery' house rules for S&W. I'm really looking forward to this. Perhaps I'll finally run a Kane-inspired campaign! UPDATE (7-Feb): Newt explains some of the reasons for the new version of C&T here.